Shirts With Random Triangles: Former Washington wide receiver Damore'ea Stringfellow transfers to Nebraska. Former Washington wide receiver Damore'ea Stringfellow transfers to Nebraska. Damore'ea Stringfellow (9). Photo via The Seattle Times. Damore'ea Stringfellow is transferring to Nebraska. 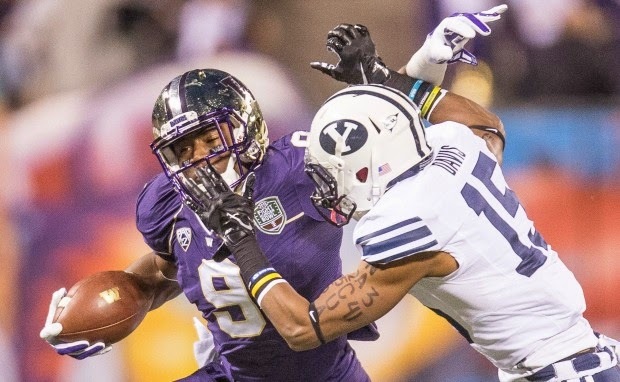 The former Washington Huskies wide receiver signed the paperwork to make the transfer official on Saturday. Stringfellow and teammate Cyler Miles (quarterback) were suspended from the Washington program by first-year head coach Chris Petersen following an altercation in Seattle on Feb. 2 with two persons identified as "(Seattle) Seahawks fans after the Seahawks won Super Bowl XLVIII. He plead guilty to three misdemeanor charges involved with the incident. Stringfellow will sit out the 2014 season due to NCAA regulations.